View this sample resume for a makeup artist, or download the makeup artist resume template in Word. Does your resume paint you as a winner, or is its look dated and in need of a makeover? To be considered for top makeup artist jobs, resume expert Kim Isaacs says it helps to have a flawless resume. 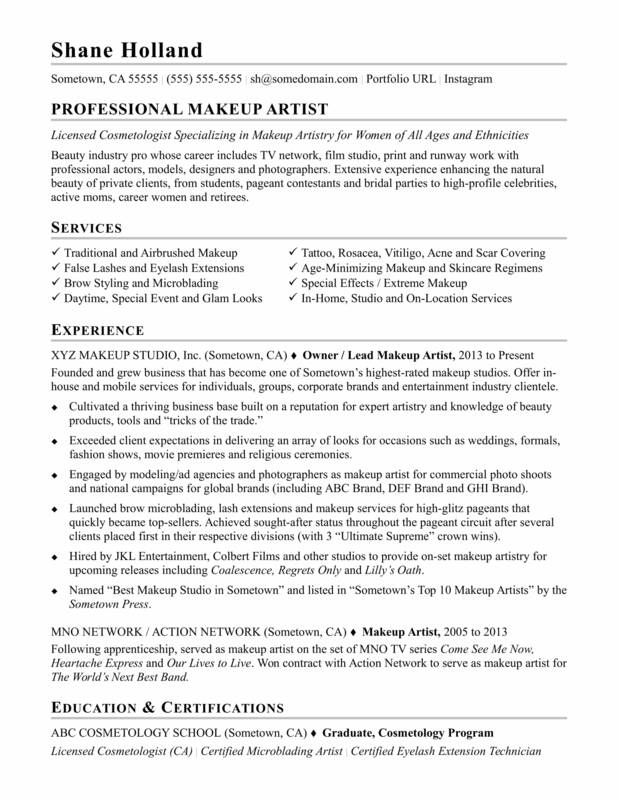 For resume writing tips, view this sample resume for a makeup artist that Isaacs created below, or download the makeup artist resume template in Word. And if you need more help, get a free resume evaluation today from the experts at Monster's Resume Writing Service. Jobs for makeup artists are projected to grow by 13% (or 87,600 jobs) from 2016 through 2026, which is faster than average, according to the Bureau of Labor Statistics (BLS). You'll find the highest level of employment for this job in the following states: California, Florida, New York, Pennsylvania, and Texas; and in the following metropolitan areas: New York City, Chicago, Minneapolis, Los Angeles, and Boston. As a makeup artist, you can expect to earn a median wage of $24,900 per year, or $11.97 per hour, according to the BLS. Additionally, you can learn about personal service careers and search for makeup artist jobs on Monster. Beauty industry pro whose career includes TV network, film studio, print and runway work with professional actors, models, designers and photographers. Extensive experience enhancing the natural beauty of private clients, from students, pageant contestants and bridal parties to high-profile celebrities, active moms, career women and retirees. Founded and grew business that has become one of Sometown’s highest-rated makeup studios. Offer in-house and mobile services for individuals, groups, corporate brands and entertainment industry clientele. Exceeded client expectations in delivering an array of looks for occasions such as weddings, formals, fashion shows, movie premieres and religious ceremonies. Engaged by modeling/ad agencies and photographers as makeup artist for commercial photo shoots and national campaigns for global brands (including ABC Brand, DEF Brand and GHI Brand). Launched brow microblading, lash extensions and makeup services for high-glitz pageants that quickly became top-sellers. Achieved sought-after status throughout the pageant circuit after several clients placed first in their respective divisions (with 3 “Ultimate Supreme” crown wins). Hired by JKL Entertainment, Colbert Films and other studios to provide on-set makeup artistry for upcoming releases including Coalescence, Regrets Only and Lilly’s Oath. Named “Best Makeup Studio in Sometown” and listed in “Sometown’s Top 10 Makeup Artists” by the Sometown Press. Following apprenticeship, served as makeup artist on the set of MNO TV series Come See Me Now, Heartache Express and Our Lives to Live. Won contract with Action Network to serve as makeup artist for The World’s Next Best Band.